Some purists who broil their fish use a special plate with a recessed part that holds the fish and the juices. 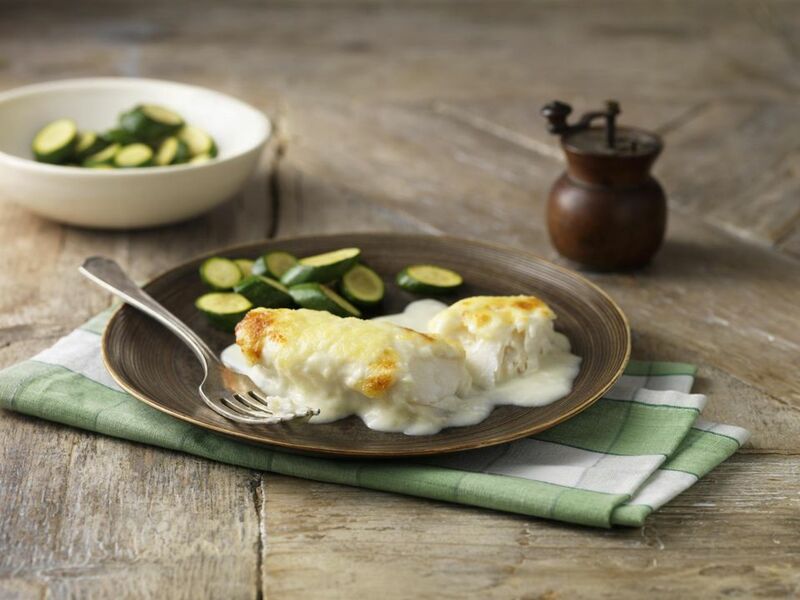 But if you don't have one, prepare this recipe for broiled haddock on foil or a greased cookie sheet. Lay the fillets skin side down—even if there is no skin—on a buttered broiler pan. A fish pan is ideal, but any heavy broiler pan will do. Cover it with foil to make cleanup easier. Salt the fish well, then slice the butter thinly and lay the pats on the haddock fillets. Top with a generous sprinkling of breadcrumbs. Broil for 10 minutes per inch of thickness of the fish, based on how wide the fillet is at its widest point. It'll take at least 5 minutes, even for thin fillets like sole. Remove and grind black pepper over the fish, add more butter if you wish, and serve piping hot with lemon wedges. I like crusty bread and a simple salad to go with this recipe. What kind of wine should drink with this fish? Chardonnay would be nice, as would a crisp Italian white such as Pinot Grigio. Figure on 1 fillet per person. This is a quick and easy recipe for haddock, cod, pollock, sole, flounder, or any thin, delicate fish fillet; walleye would be good, too. For variety or if you prefer more heat and fewer carbs, substitute spices for the breadcrumbs. Mix together 1/4 teaspoon each of smoked paprika, garlic powder, onion powder, cayenne pepper, fresh ground black pepper, and salt. Coat the haddock with the spice mixture on both sides before you add the butter; place on the broiler and dot with pats of butter, as in the breadcrumbs recipe. Follow the same directions for cooking and serving as above for a light and flavorful dinner.